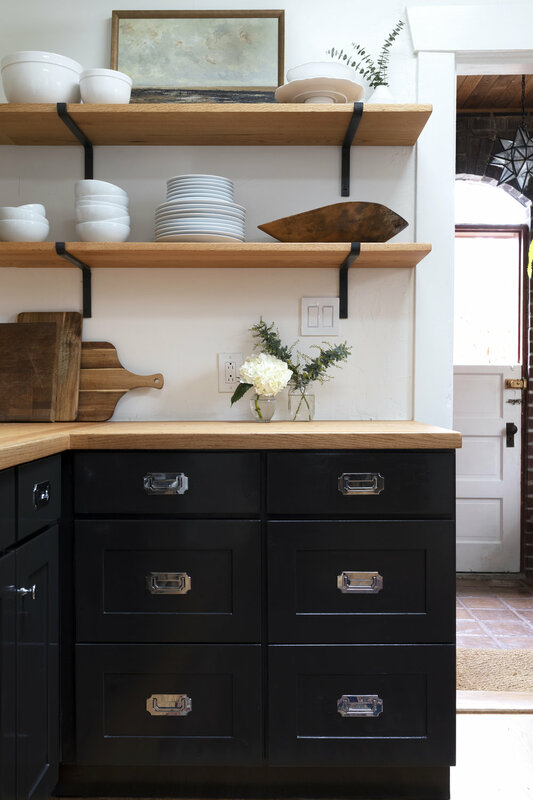 We’ve used butcher block countertops in 5 of our 8 kitchen renovations to date and we’ll be using them again in our Farmhouse kitchen this Spring. In all of those kitchen renovations, we’ve learned a lot about wood countertops, made some mistakes, and learned what works best for us. We shared some butcher block basics a couple years ago (here), and today we wanted to dive deeper into the types of wood we’ve used and where we’ve found they work best (and where they don’t!). This is hands-down Garrett and my favorite butcher block. We shared more about this 2 1/2”-thick beauty in this post. It was a custom order from Uncle Dougie’s family company, Hardwood Industries, and was featured on our HGTV pilot, Master Plan. We eventually finished it with a wax conditioner from our local Ace Hardware and it darkened up quite a bit (see below). Nana and Papa (who bought the house) now condition the butcher block with this product every couple of months and it is still just as beautiful as the day we installed it 2 years ago. We selected red oak butcher block countertops (again from Hardwood Industries) to match the original floors, which we matched in the kitchen. We originally sealed the countertops with Waterlox but after 2 years, we refinished them and used Howard’s Wood Polish and Conditioner this time. 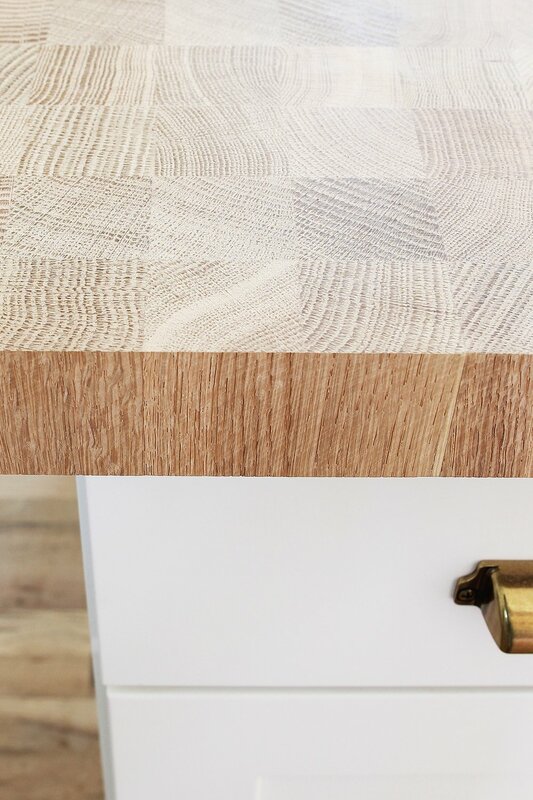 We’ve tried all sorts of finishes for butcher block over the years and we’ve used this one the most (in part because it’s readily available), but we haven’t found one that we’re like: “this is the only finish we’ll ever use again.” Everything we’ve tried has worked differently and had their strengths. One thing I do like about Howard’s is that you can add it anytime the countertops look dry (just make sure they’re clean first). Also, I should mention that we don’t use our countertops as cutting boards. We opted for inexpensive countertops that we could install ourselves at the Bryant House. These maple blocks cost us $460 and add a nice, warm element to the kitchen (the rest of the kitchen budget is here). These also came from Hardwood Industries, and are noticeably harder than the Maple blocks we bought at IKEA for the Wallingford House in 2009. There’s one place we’ve learned to avoid putting butcher blocks: near sinks. 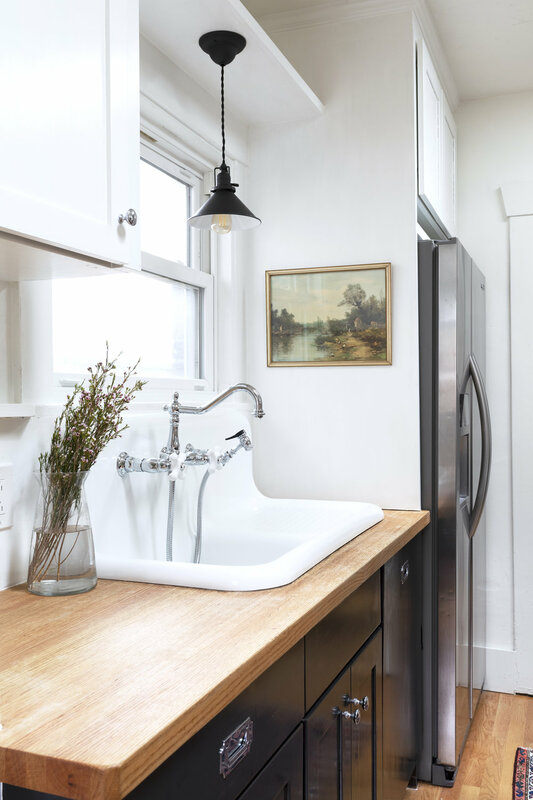 I’m not saying we won’t do it again (because I love the look), but butcher block countertops near water require more maintenance. Ideally we’d condition/seal these countertops monthly and refinish them every year. But our homes usually turn into rentals, which make monthly maintenance nearly impossible. At Bryant and Dexter, rentals where we have butcher block next to the sink, we’ve found that the wood has discolored and dried out (you can see it a bit in the following pictures). Bryant is worse than Dexter since we installed an undercount sink there. Dexter has an over mount sink with integral backsplash so gets less water on the countertop. Both butcher blocks still function fine, and don’t need replaced or anything, but in general it’s not ideal placement. Where we do like having butcher block countertops is on islands (where we don’t put sinks). I love an expansive wood island without any appliances or sinks to interrupt the work surface. And that’s exactly where we’re planning to add a large butcher block countertop in our upcoming Farmhouse kitchen renovation this Spring. We’d love to hear about your experience with butcher block. Do you love wood countertops? Hate them? Anyone had more success with butcher block around sinks? Let us know in the comments below!